For the last six months, there have been two names passed on by word of mouth: Lonzo Ball and LaVar Ball. Even though the only name that should be ringing in people’s ears is Lonzo, his father, LaVar, has become the center of his son’s basketball career. LaVar is a 48-year-old retired American football player who also played college basketball. He is also the owner of a clothing brand named Big Baller Brand (BBB), inspired on his three sons. Lonzo, freshman point guard at UCLA, is projected as a top-five NBA pick and he is also expected to play professionally this coming year. As a freshman, he led his team in minutes with 35.1 minutes per game, while also averaging 14.6 points, 6.0 rebounds and nation-leading 7.6 assists per game. With just one year of experience in college, Lonzo also received multiple accolades rewarding his basketball performance. Ball earned a consensus first-team All-America honor, first-team All-Pac-12 selection, Pac-12 Player of the Year and Freshman of the Year, among others. What seems to be start of a brilliant career for a 19-year-old kid, who should be shining on his own, has seemingly made a 180.. This has become LaVar’s marketing campaign to promote the abhorrence towards his child among sports fans, current and ex-NBA players and sports experts. On Saturday, Feb. 18, LaVar was interviewed during a Pac-12 game between UCLA and University of South Carolina (USC). 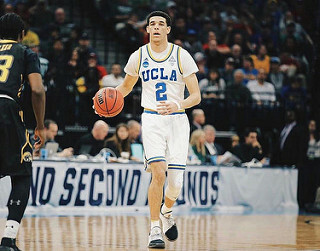 UCLA beat USC 102-70 and Lonzo finished the game with 15 points, eight rebounds and eight assists. However, all eyes were focused on his father because earlier in the week he affirmed his kid would be better than Steph Curry. So, the interviewer alluded to that comment, and of course, he did it again. Comparing the greatest shooter in NBA History, a two-time NBA MVP of 2015 and 2016 and all-time NBA record holder for three-pointers in a season (484 threes in 2016), to a freshman who is just starting his basketball career, is called insanity. That same month, LaVar was getting upset because he didn’t make enough ridiculous statements about his son, so, in another interview, he was brave enough to say what follows. How is it possible to be the best player in the whole world and not being able to beat them one-on-one? The one-on-one capability is the basics of basketball because you are trying to defeat your defender to obtain any kind of advantage. So, does this statement mean that five Lonzo’s would beat a team with “LeBrons” and “Westbrooks?” Again, comparisons are odious, and all LaVar is accomplishing with it is putting extra expectations on his kid, and a target on his head. As if that was not enough, on March 14, LaVar showed off his arrogance once again in an interview with Josh Peter for USA TODAY. He claimed that he could have beat Michael Jordan. LaVar played as a forward for Washington State University, Division I school before he transferred to Division II. Ball averaged 2.2 points, 2.3 rebounds and 1.0 assists per game during the 1987-88 season for the Cougars. At the same time, Michael Jordan was playing for the Chicago Bulls and winning the NBA title in 1998. Jordan was also named MVP as he averaged 35 points, 5.5 rebounds and 5.9 assists per game. Even with the proof in front of his face, there are none so blind as those that cannot see. LaVar kept feeding his own ego and went off with more declarations about one of the best players in the history of the NBA and himself. Parents are extremely important for a child’s life, but there are some limits a father can’t trespass and LaVar is constantly and consciously doing it. On that same interview for USA TODAY, LaVar was still greedy as ever. He even said that his plans for his three sons are to close a deal with either Nike, Adidas or Under Armour for $1 billion dollars. Like the case of Marv Marinovich, retired American football player and first strength and conditioning coach in NFL history. Marinovic was obsessed with fitness and health. So, he would try his methods with his child, like stretching him and giving him only fruit and vegetables when he was only a baby. There is no doubt that Lonzo is a great basketball player and that if things keep going well, he could do important things in his career. Although, he is going to carry a heavy burden on his image because of what LaVar is doing. What for LaVar seems to be a promoting strategy for his kid, has turned out to be the “LaVar Ball reality show.” Everybody is anxious to see what is the next thing that is going to come out of his mouth. However, Ball is not realizing that if you play with fire, you also can get burned.